In early November the campus of Southern Methodist University in Dallas, Texas hosted a conference to celebrate the 25th anniversary of HECAA, the Historians of Eighteenth-Century Art and Architecture. It was a rich and thought-provoking weekend full of talks, museum visits and social opportunities; Craig Ashley Hanson wrote wonderful overview of the conference which appeared on Enfilade, HECAA’s official news outlet. While there were numerous offerings on the program that would interest the readers of Home Subjects, of particular note was the session on the first afternoon of the conference titled “Apprehending the Spatial: Approaches and Methods.” This panel brought together three speakers who addressed space as a category of cultural analysis from three different perspectives: the garden, the room interior, and the urban neighborhood. 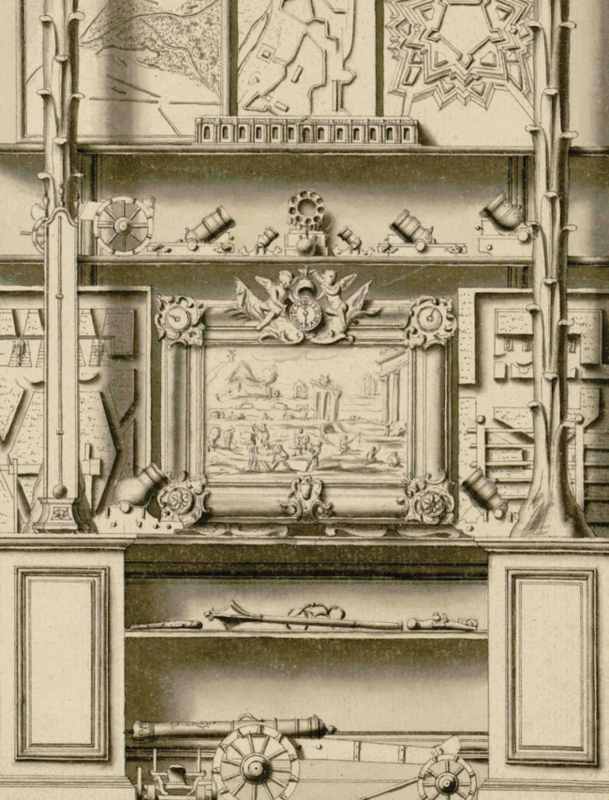 Jean Courtonne, detail of Bonnier de la Mosson’s physical sciences cabinet. From Recueil des dessins des cabinets de curiosites de M. Bonnier de la Mosson, 1739-40. Thinking about space in terms of the relationship between the interior and the exterior of the private dwelling, Lauren Cannady of the Clark Art Institute discussed the Paris townhouse of Joseph Bonnier de la Mosson, the amateur natural historian. Bonnier assembled a remarkable collection of specimens in his cabinet in his house, the hôtel du Lude. 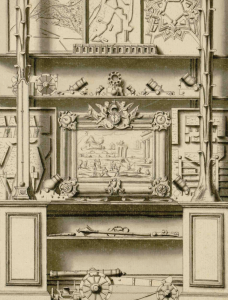 The cabinet encompassed a series of rooms, the appearance of which were recorded by Jean Cortonne in 1739-40. Cannady’s talk connected the rooms of Bonnier’s cabinet with the gardens that were contiguous with them, and focused attention on a series of plans and views that suggestively hinted at the close relationship between the two. Laurel Peterson of the Morgan Library & Museum, who is a previous contributor to Home Subjects, discussed the decoration of the state apartments at Chatsworth, using astute visual analysis in concert with a variety of period sources to suggest a new reading of the magnificent painting by Antonio Verrio that adorns the ceiling in the Great Chamber. Peterson’s talk illuminated the political impulses that underwrote the creation of the state apartments and argued persuasively that the ceilings celebrated the rule of Mary II in ways that had not previously been appreciated. 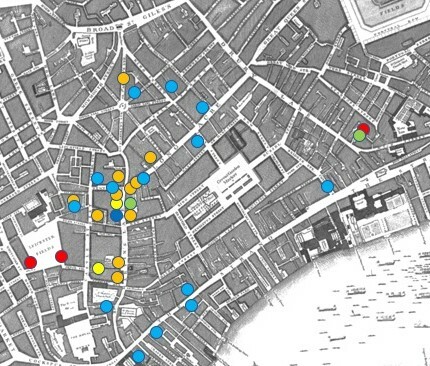 Map of St Martin’s Lane with the residences and workshops of artists and craftspeople denoted. Courtesy of Stacey Sloboda. While the first two speakers each engaged in depth with a single building and its spaces, Stacey Sloboda of the University of Massachusetts Boston finished the panel with a fascinating discussion of the development of an artistic neighborhood. Sloboda presented her work on St. Martin’s Lane, often associated with the academy that William Hogarth organized there in the 1730s. As Sloboda suggests, however, the significance of St. Martin’s Lane can only be fully appreciated by a full accounting of the artists, printmakers, and other artisans (notably cabinet-makers like Thomas Chippendale) who lived and worked in it. Their relationships with their neighbors and investment in this neighborhood can illuminate artistic practice in important ways. All three presentations, in different ways, suggested that the private interior should always be considered as a space that is in conversation with the world outside, whether in the form of the garden, the political intrigue of the court, or the bustling neighborhood of craftspeople in which it is situated. This opening out of the approach to thinking about the domestic interior can only enrich the understanding of what is happening within.